Showcase your Pool with a Custom Pool House that combines Beauty, Storage, and Convenience to match your garden or landscape. Change the Look & Feel of your Entire Backyard by adding onto existing or all new with Pavers or other outdoor flooring like Trex Transcend. 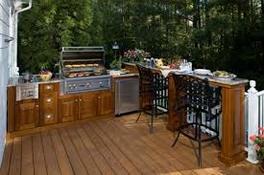 Combine 2 of your favorite activities, Swimming & Eating with Family & Friends with a Custom Outdoor Kitchen. Heritage Home Improvements is your Old Saybrook Ct certified, licensed and insured General Contractor who can take care of your electrical, plumbing, Patio, Pavers, and anything connected to your Pool House Construction Project. At Heritage Home Improvements your Old Saybrook Ct Pool and Patio Contractors we pay close attention to details and required building codes like distance from the Pool often based on water depth. A Pool House with Outdoor Kitchen, Fridge, and Sink helps keep people from going in and out of the house keeping your home clean and puddle free. 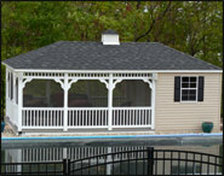 A Pool House in case of rain with a wide overhang allows you to have fresh air keeping you out of the sun. A great place to set up a home gym. 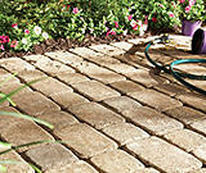 Storage of pool chemicals, pool toys, and pool & garden furniture in the winter. If space and budget allows, a pool house with a bed & bath is a great guest option allowing you to keep the privacy of your home.